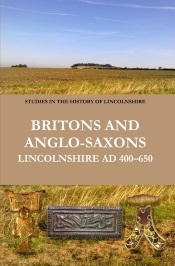 The following post offers a brief look at the evolution of the coastline of north-eastern Lincolnshire and Spurn Head from the Mesolithic through until the start of the Roman era, a period that saw dramatic changes as an inland forested region was gradually flooded by the rising tide to become the new coastal zone. Included below are a series of palaeogeographic maps that offer reconstructions of the coastline at various points in prehistory, along with some brief commentary on the changes and developments that each map shows. The extent of Doggerland in around 10,000 BC, towards the end of the last glacial era, along with suggested reindeer migration routes in that period (drawn by C. R. Green for Origins of Louth, based on Barton, 2005 and Shennan et al, 2000, with permission). Ahrensburgian tanged points, or arrow tips, of this period have been found in north Lincolnshire, which are identical to finds associated with reindeer hunting in northern Germany then. The Mesolithic landscape of Doggerland, now the floor of the North Sea, as revealed by 3D seismic data collected by the North Sea oil and gas industry (image source: Vincent Gaffney). A reconstruction of the Mesolithic coastline as it existed around 7000 BC, with Louth in eastern Lincolnshire marked to aid with location (image drawn by C. R. Green, based on data from Shennan et al, 2000). 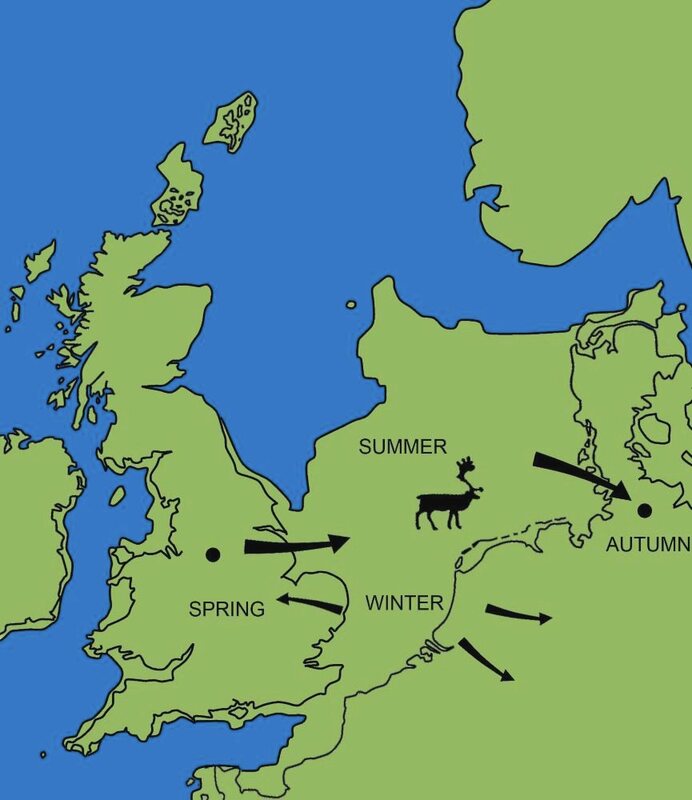 The landscape of north-eastern Lincolnshire and south-eastern Holderness in around 6500 BC; at this point in the Mesolithic, the coastline still lay outside the region under consideration in the present post (image drawn by C. R. Green, after Berridge & Pattison, 1994). Note, the present-day coastline from approximately Saltfleet in Lincolnshire to Easington in the East Riding of Yorkshire is shown in grey. 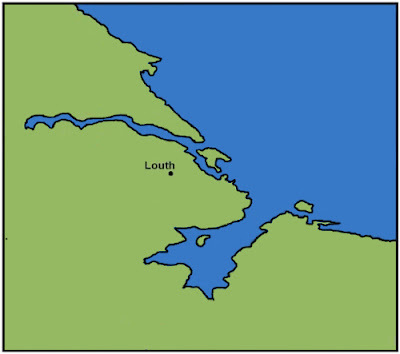 A reconstruction of the Mesolithic coastline as it existed sometime around 6000–5500 BC, with Louth in eastern Lincolnshire marked to aid with location (image drawn by C. R. Green, based on data from Shennan et al, 2000, with modifications). 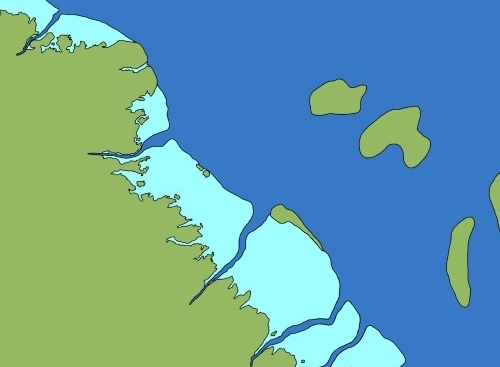 Note, the marine flooding had reached Theddlethorpe by c. 6000 BC; it also created offshore islands from former higher ground to the east and north of the modern Lincolnshire and Norfolk coastlines in approximately this period — these islands are thought to have persisted until the later thirteenth century AD, before they were finally destroyed by storms and flooding. 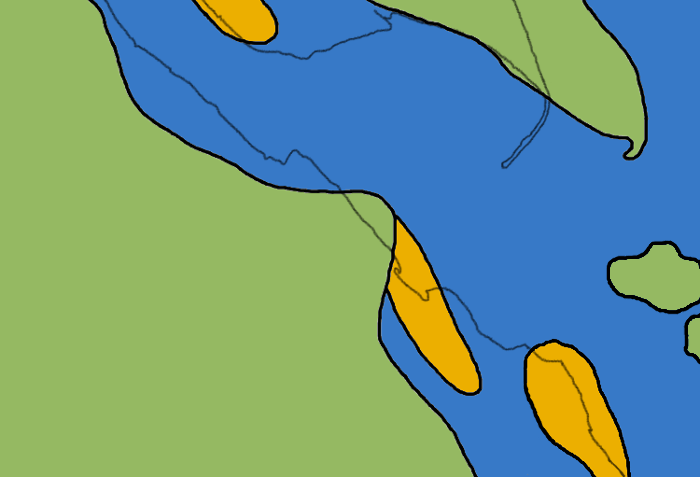 The coastline of north-eastern Lincolnshire and south-eastern Holderness sometime around 5000 BC (image drawn by C. R. Green, based on underlying till-surface contour data reported in Berridge & Pattison, 1994, with additions and modifications). As before, the present-day coastline from approximately Saltfleet in Lincolnshire to Easington in the East Riding of Yorkshire is shown in grey. 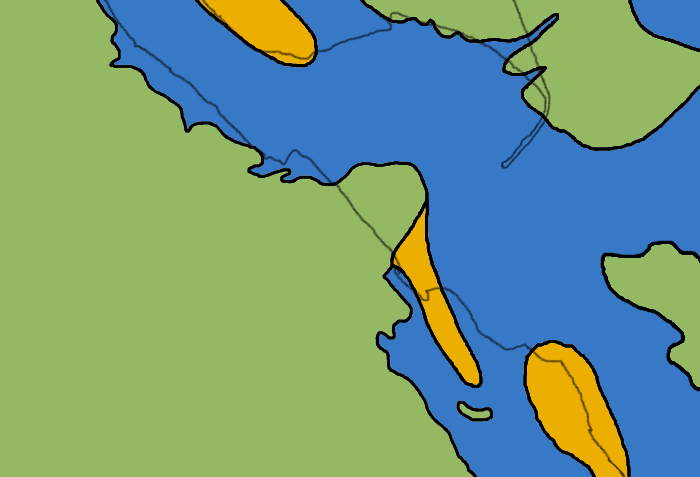 By this point, the coastal zone lay well within our region, with the Lincolnshire coast being protected by offshore islands; the sand body that underlies the North Somercotes–Saltfleet storm beach appears to have first formed in this period too, based on borehole records, and a very notional representation of this is included above. This flooding had a dramatic effect on the vegetation of the region, with the mature mixed deciduous forest that had once stretched out onto the North Sea plain being replaced by wetlands and a coastal landscape. The tree stumps and trunks that are revealed at very low tides and in excavations all along the Lincolnshire coast from Immingham to Ingoldmells have their origins in this lost prehistoric forest, which was first subject to waterlogging as the water-table rose and was then submerged by the rising tide. 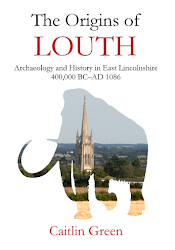 The date of this death and submersion varies from site to site depending on the elevation of the land on which the forest grew, but at Immingham and Theddlethorpe the waterlogging has been dated to 5772–5346 BC (recalibrated) and 6174–5961 BC respectively. With regard to the resultant Late Mesolithic coastal landscape of northern Lincolnshire and Holderness, several features need noting. First, a comparison of both of the above maps with the preceding pair show that it was in this period that the peninsula of Holderness began to take on a recognizable form, although its south-eastern tip had a rather different profile to that which it has today. Second, the higher ground that had previously lain to the east and north of the present-day coastlines of Lincolnshire and Norfolk is thought to have been gradually surrounded by the rising tide, becoming coastal barrier islands that seem to have persisted through until their final destruction by the sea in the late thirteenth century AD. Initially, at least, this high ground off the Lincolnshire coast may have become a single island, and it is shown as such on the above reconstruction, before later splitting into a number of smaller islands as the sea-level continued to climb. Third and finally, a cross-section of the Lincolnshire Outmarsh running east–west through Marshchapel and Donna Nook (North Somercotes) created from borehole records indicates that the coastal sand body that underlies the current storm beach on the Lincolnshire coast from Donna Nook to Saltfleet formed directly on top of the Mesolithic land surface and must have been in existence from the first arrival of the sea in this area; as such, a notional representation of it is included on the above map. A very small, partially polished Neolithic axe, found at Grainthorpe, Lincolnshire (image: PAS). 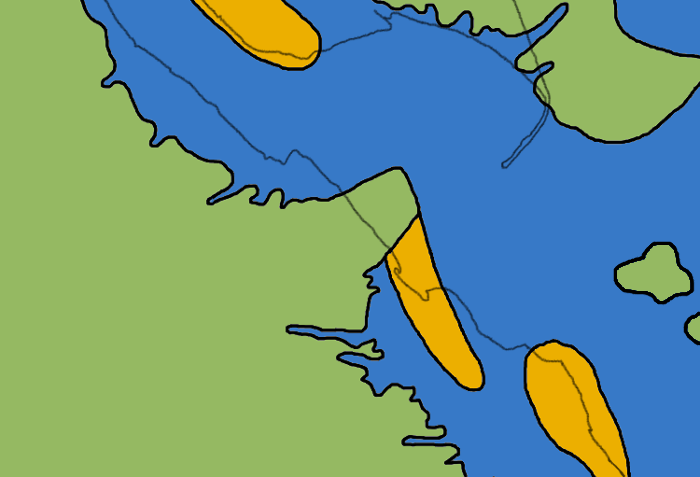 The coastline of north-eastern Lincolnshire and south-eastern Holderness in the Neolithic era, sometime around 3000 BC (image drawn by C. R. Green, based on underlying till-surface contour data reported in Berridge & Pattison, 1994, with additions and modifications). As before, the present-day coastline from approximately Saltfleet in Lincolnshire to Easington in the East Riding of Yorkshire is shown in grey. 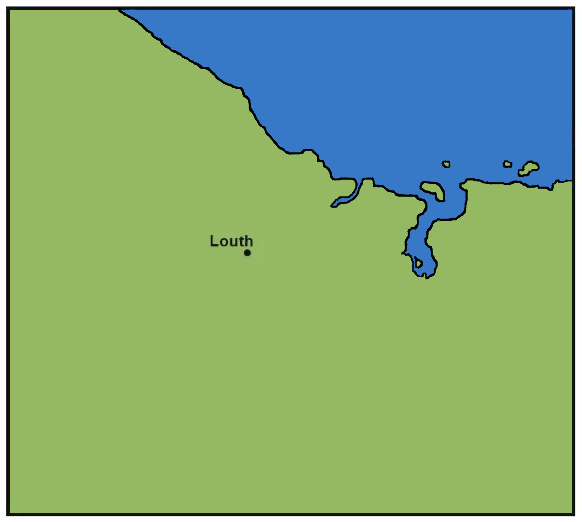 The coastline of north-eastern Lincolnshire and south-eastern Holderness in the Early Bronze Age, sometime around 2000 BC (image drawn by C. R. Green, after a map in Berridge & Pattison, 1994, with some modifications). As before, the present-day coastline from approximately Saltfleet in Lincolnshire to Easington in the East Riding of Yorkshire is shown in grey. The next two maps offer possible reconstructions of the coastline of north-eastern Lincolnshire and south-eastern Holderness in the Neolithic and Early Bronze Age. Continued—albeit now significantly slower—sea-level rise is thought to have a led to further coastal areas being submerged by the rising tide, with the result that by around 2000 BC or so the Lincolnshire coastline lay significantly inland of its current position. It is also possible that the offshore coastal barrier had been divided up into several smaller islands by this point. 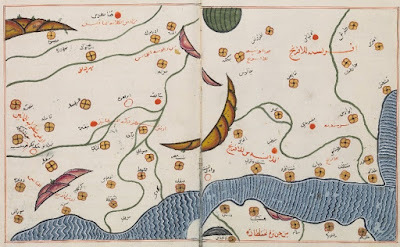 Whether these offshore islands were inhabited or visited by people in this era is entirely unclear due to their subsequent destruction by the sea in the medieval period, although it seems inherently likely that they were. Certainly there may well have been some activity within the coastal zone on areas of dryer land closer to shore, such as the small island of glacial till that was probably surrounded by coastal marshes visible on the Neolithic map at Grainthorpe. 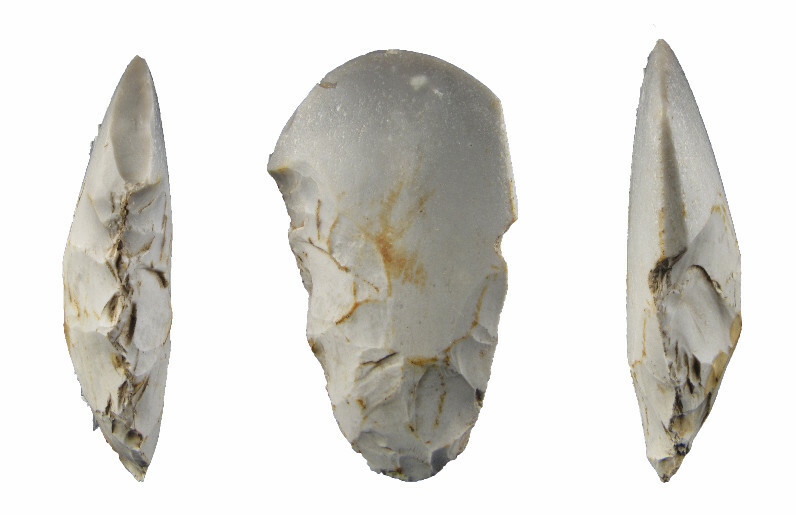 For example, not only is a Mesolithic axe or pick known from Grainthorpe, testifying to an earlier human presence, but there are also a number of Neolithic flint objects (including a knife and a possible votive axe) from the area of this island, and beaker sherds have been found from a spot to the north that have been seen as indicative of the presence of a Late Neolithic/Early Bronze Age barrow here in the coastal zone. Other features of note on these maps include the continued development and definition of the south-eastern tip of Holderness, although as yet there was nothing approximating Spurn Head, with the profile of the peninsula still instead following the lines first set down by the Mesolithic course of the River Humber as it flowed north-eastwards across Doggerland. Also significant is the development of a second major sand body/sand bank off the coast of Lincolnshire, running from the peninsula of glacial till at Cleethorpes down to the Marshchapel/Grainthorpe area, as evidenced once again in borehole records from this region. This sand bank seems to have developed sometime around 3000 BC (perhaps above an earlier Late Mesolithic/Early Neolithic coastline and after a period of marine flooding, to judge from the borehole data and underlying till surface contours), with tidal flat or lagoonal conditions on its landward side. 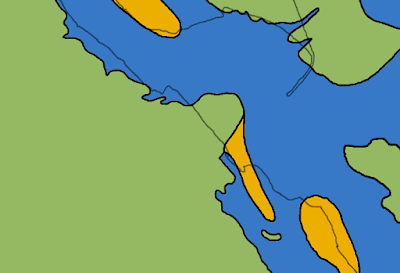 It is likely that similar conditions now prevailed on the landward side of the North Somercotes–Saltfleet sand body and bank too, with the former dry land to its west having been submerged by the rising sea-level and becoming coastal marshes or the like whilst the sand body itself continued to persist and build up. Another less well-evidenced sand body on the southern coast of Holderness may similarly have its origins in this era, running south-eastwards from the islands of glacial till and gravels near Paull (not mapped). In terms of the vegetation of the region, the continued sea-level rise led to further water-logging and submersion of the coastal woodland on sites that had been too elevated to be affected by this during the Later Mesolithic, with the drowned trees preserved at Cleethorpes and Chapel St Leonards dying off sometime around 2950–2250 BC and 3370–3020 BC respectively. The Mesolithic forest inland of the coastal zone also saw significant losses in this era. These losses appear to have begun on the high ground of the Lincolnshire Wolds, with the Mesolithic deciduous oak and hazel woodland of the Wolds cleared at Skendleby by c. 3500 BC and an open grassy landscape with indications of at least local arable agriculture having developed at Swinhope by c. 3900–3650 BC. On the lower ground, just inland of the coastal zone, the wooded landscape may well have survived a little longer, but it too was eventually lost. For example, at Butterbump (Willoughby), on the eastern edge of the dry Lincolnshire Middle Marsh, the available pollen cores indicate that the Mesolithic forest there survived the Early Neolithic through until perhaps 2900 BC, but was apparently largely cleared in the Late Neolithic/Early Bronze Age, with subsequent eras then having low levels of tree and shrub pollens and high levels of herb and cereal. Similarly, in Holderness a degree of sustained clearance began around 3600 BC, but the landscape of this area also wasn't properly opened up until the end of the Neolithic (c. 2500 BC), and only from the end of the Bronze Age (around 800 BC) did agricultural land start to dominate. 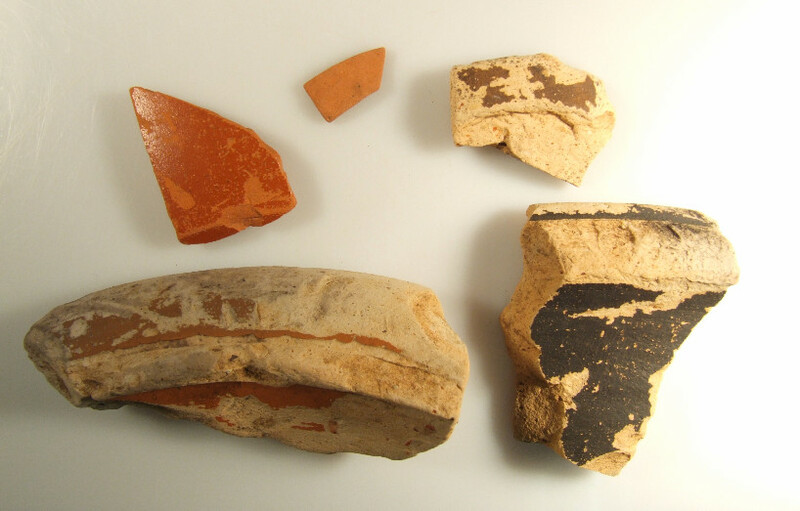 Sherds of Roman Nene Valley colour-coated pottery and imported Samian ware, found at Grainthorpe, Lincolnshire (image: PAS). The coastline of north-eastern Lincolnshire and south-eastern Holderness at the start of the first century AD (image drawn by C. R. Green, after a map in Berridge & Pattison, 1994, with some modifications). As before, the present-day coastline from approximately Saltfleet in Lincolnshire to Easington in the East Riding of Yorkshire is shown in grey. 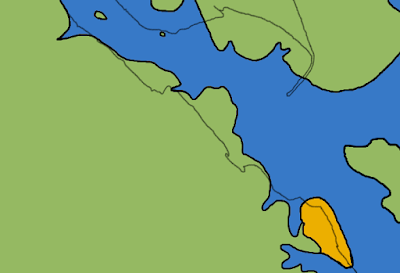 Note, all of these maps show the approximate position of the coastline in this period; however, there would also have been an extensive zone of coastal marshes, inter-tidal flats and the like too on the seaward side of this coastline; these are not mapped here, but they clearly saw a significant degree activity in the Roman period. 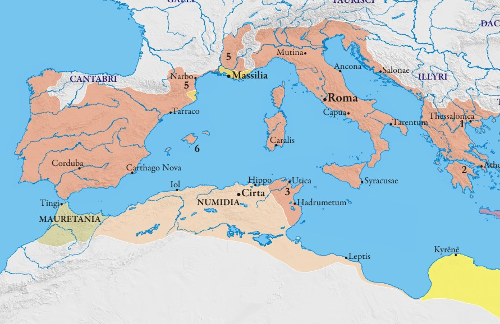 The final map offers a suggested reconstruction of the coastline of this region at the start of the first century AD. As before, there are several features and points worth noting with regard to the coastal landscape in this era. First, a degree of marine regression by the Early Roman period probably led to the coastal zone moving back eastwards from its earlier westward maximum extension in the Lincolnshire Marshes area. 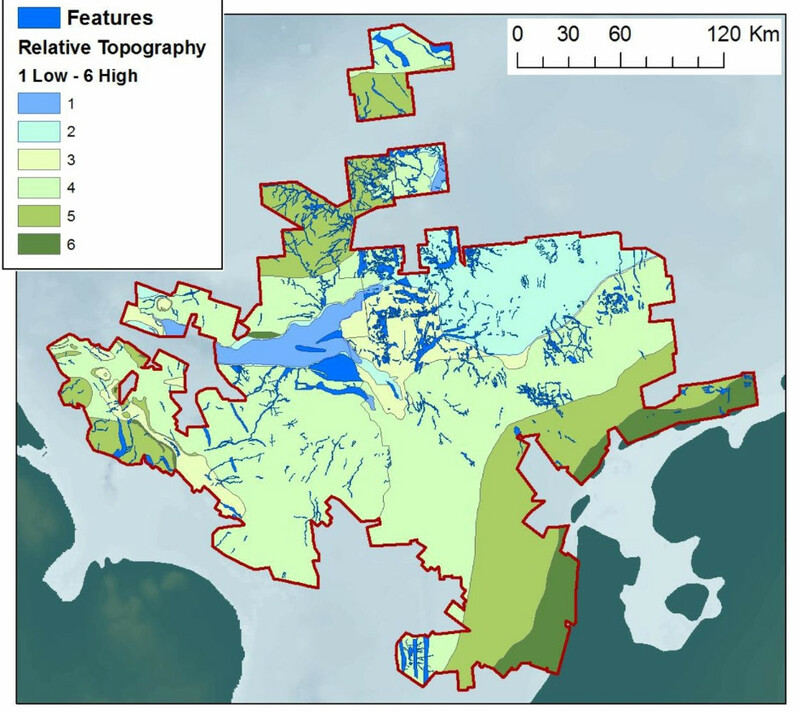 Second, the coastal marshes that continued to lie behind and close to the two major sand bodies in north-eastern Lincolnshire—despite the marine regression—saw a significant degree of activity in this era. Quantities of Roman material have been found from the Roman-era coastal marshes and margins at, for example, Marshchapel, Grainthorpe, South Cockerington, Scupholme (South Somercotes) and Saltfleetby St Peter, with some of the finds including imported pottery and box-flue tiles. With regard to the nature of this activity, the relatively substantial structure indicated by finds of pottery and building materials at Marshchapel has been interpreted as one situated within the coastal zone, perhaps on the saltmarsh itself, and probably involved in the end-stage processing and transportation of salt produced at nearby salterns. With regard to other aspects of the first-century AD landscape, the development of the south-eastern tip of the Holderness peninsula had probably by now continued to the point where it was finally starting to take on something approaching its modern form and with a proto-Spurn Head starting to form, although the coast of Holderness and the tip of the peninsula still lay well to the east of their current position, which is the result of a further 2,000 years of coastal erosion by the North Sea. Similarly, the peninsula of glacial till at Cleethorpes that extended out into the Humber estuary had by now started to be seriously eroded away back towards its modern position, although it too continued to extend out some way beyond the current coastline. It has been suggested that this peninsula and its low cliffs were home to a Roman-era signal station or fort that stood on some of the subsequently lost land here, although it has to be admitted that the evidence is uncertain and weak—a more convincing candidate for a Late Roman fortification in this part of Lincolnshire is perhaps to be had from the area of the former Toote Hill, nr Grimsby. 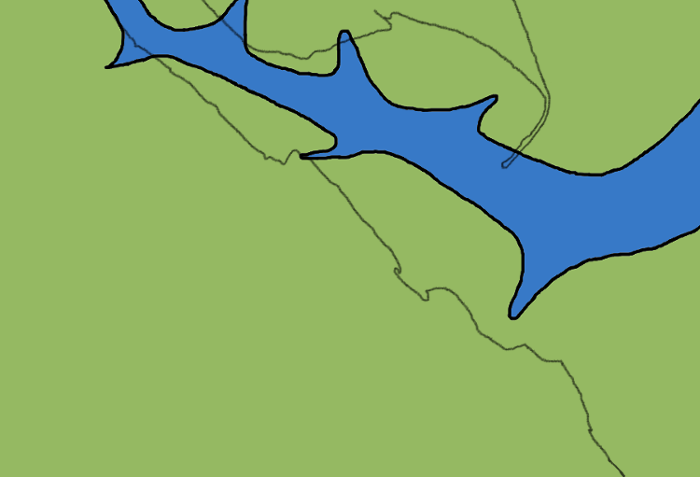 The north-eastern part of the Lincolnshire Marshes in the Late Roman and post-Roman eras, taken from a map created for a previous post; note, the light blue area represents a possible reconstruction of the extent of the coastal wetlands/saltmarsh during this period of maximum marine transgression (image: C. R. Green). 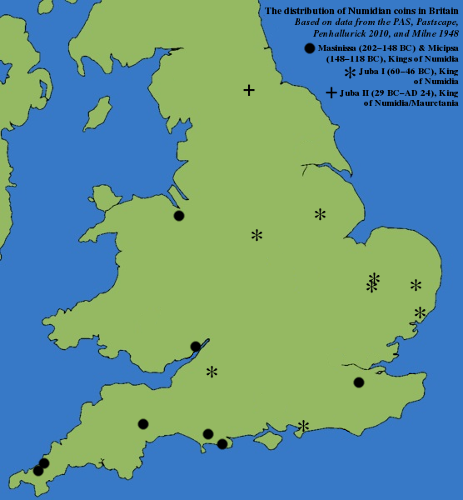 The later evolution of the coastline of Lincolnshire after the Early Roman era largely lies beyond the scope of this post, being discussed and mapped in two previous pieces on this site, one dealing with the Late Roman and pre-Viking coastline (reproduced above) and the other with the situation in the medieval era. Two points are worth noting here, however. 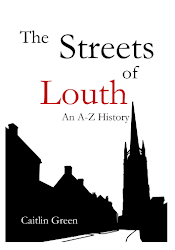 The first is that the fourth- to sixth-centuries AD appear to have seen a significant marine transgression in the Lincoln region. 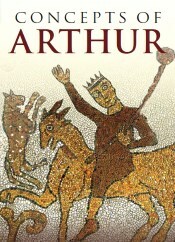 This led to Romano-British sites on the Lincolnshire Outmarsh being submerged and subsequently buried under several metres of marine alluvium—for example, the Romano-British site at Scupholme, mentioned above, was found beneath more than three metres of alluvium deposited by the sea, whilst Romano-British salterns at Ingoldmells to the south were smothered by two to three metres of silt. This Late/post-Roman marine transgression also seems to have largely swamped the prehistoric Cleethorpes–Marshchapel sand body and covered it over with a thin layer of marine silt (around a metre thick at North Cotes and rather less than this at Marshchapel), to judge from borehole records, with only a few sections of the former sand bank probably being left exposed to the east of Marshchapel. The second is that the North Somercotes–Saltfleet sand body seems to have survived and remained above this marine transgression, although it too appears to have been later partly buried, in this case by storm beach deposits that are often thought to have their origin in debris thrown up on the coastline by the destruction of the offshore coastal barrier islands in the thirteenth century AD, an event discussed in more detail elsewhere.